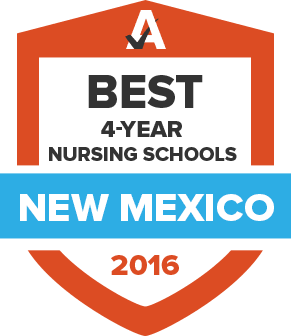 The American Association of Colleges of Nursing reports there were more than 20,000 licensed registered nurses and almost 1,650 advanced practice RNs in New Mexico in 2014. While some reports indicate that the nursing shortage may not be as severe in New Mexico as other states, some experts argue that the concern isn’t necessarily the employment outlook but rather the number of qualified nursing candidates, which means that nurses with the right experience should find promising opportunities in the state. To ensure you have the best chance of landing employment, the following guide walks you through licensing requirements and allows you to browse nursing schools in New Mexico to find the proper education and training. In 2014, 1,185 undergraduate and graduate students were enrolled in nursing schools across New Mexico, according to the American Association of Colleges of Nursing. More than half were in baccalaureate programs, but several were also working towards their master’s or doctorate degrees. As the state continues to face challenges finding experienced RNs, nursing schools have begun working on ways to better educate the state’s future nurses. Use the search tool below to explore nursing schools in New Mexico and take the first step towards your nursing career or take it to the next level. To become a nurse in New Mexico, applicants must meet a list of qualifications to ensure they have the seat time and practicum experience. The New Mexico Board of Nursing issues licenses and approves all pre-licensure nursing education programs. The Board also sets the parameters for licensure to ensure the safety of the public and to make certain that a high quality of service is maintained. Below is a list of the requirements to obtain a license for registered nursing, as well as renewal guidelines. Show proof of completion of a Board-approved course of study for registered nurses. Send official transcripts directly from the school to the Board. Register to take the NCLEX-RN with Pearson Vue and pay the appropriate fees. Residents of other Compact states must apply for licensure with their home state Board of Nursing. Complete a criminal background check with 3M Cogent: In-state applicants need to obtain fingerprints at one of the approved locations. Out-of-state applicants must obtain two fingerprint cards from a Cogent-approved facility. Residents of Compact states should apply for their license in their home state. The license is good in all Compact states. Residents of non-Compact states who wish to practice in New Mexico should apply for a single-state New Mexico license. Nurses in New Mexico can renew their license online, but must first complete 30 hours of approved continuing education within the two years preceding the license’s expiration date. To verify renewal, it is recommended that RNs visit the NM Board of Nursing Website. Renewal costs $93 and the online process is not open to anyone whose state of residence is not New Mexico or if the license has lapsed or become inactive. The US Bureau of Labor Statistics projects that New Mexico will need 14 percent more nurses in 2022 than it had in 2012. And the need for nurse anesthetists, nurse midwives and nurse practitioners is even greater. New Mexico has a low concentration of nurses to residents, according to the Health Resources and Services Administration. This may mean increased wages for nurses in certain metropolitan areas, as outlined below. The New Mexico Board of Nursing issues nursing licenses and is charged with regulating the education programs for licensees and certificate holders. Practicing nurses and the patients they serve can review the laws and rules for nurses as set forth by the Board of Nursing. The New Mexico Center for Nursing Excellence works toward advanced results in nursing education and helps to support nurses throughout their careers. It provides professional development and local events for nurses. Dedicated to the advancement of emergency nurses, the New Mexico Emergency Nurses Association is a membership organization that also provides membership to the national association. The New Mexico Nurse Association is a membership-based organization that offers nurse advocacy, continuing education, community resources and programs to support nurses in the state. This non-profit group serves the professional interests of nurse practitioners in New Mexico and works to meet the needs of both members and non-members. It promotes communication, advocacy and continuing education. The New Mexico School Nurse’s Association promotes the health and well-being of children through the advancement of the school nursing profession. It provides opportunities for school nurses to further their education and develop higher professional standards.